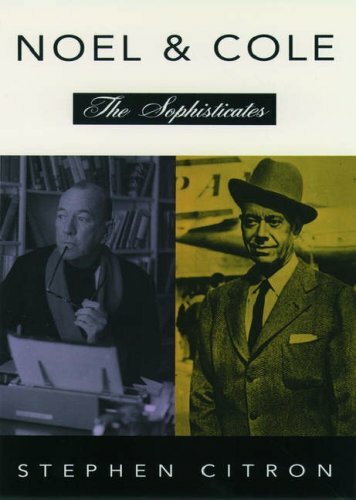 Born an ocean apart--one in Peru, Indiana, to great wealth, the other in Teddington, England, to an itinerant piano salesman--Cole Porter and Noel Coward have come to represent the ultimate in sophistication and urbanity. "You Do Something to Me," Gay Divorce, "I Get a Kick Out of You," "Just One of Those Things," Anything Goes, "Begin the Beguine," Private Lives, "Night and Day," Blithe Spirit, "Let's Do It," Hay Fever, "It's De-Lovely"--the list of witty and irreverent songs and plays goes on and on. It is a body of work that was tremendously exciting when it first appeared and remains remarkably popular today. Based on access to previously unpublished manuscripts, lyrics, scores and letters, plus dozens of interviews, Noel and Cole presents a fresh and often surprising portrait of these two geniuses and their work, packed with numerous photographs, some of which have never been published before. Stephen Citron interweaves the biographical strands with consummate skill, providing insight into both men's private lives--including a frank discussion of their homosexuality--while illuminating their musical achievements. Indeed Citron, a composer and lyricist himself, excels at musical analysis, and throughout the volume he sheds considerable light on Porter's and Coward's art. He tells us, for instance, that in composing the melody of "Night and Day," Cole Porter restricted himself to mid-range notes, with hardly any vocal leaps that would betray a breathless dancer, especially as the dancer was Fred Astaire, who had never studied singing seriously, and was just launching his solo career. (Citron also tells us that Astaire wanted "Night and Day" dropped from the show, because he feared that with its long-held notes, especially on the word "day," his voice would crack.) Citron also shows how fast a worker Noel Coward could be: Coward wrote Hay Fever in three days, for instance, and his finest play, Private Lives, took him four days (while he was laid low with a bout of influenza in Shanghai). Packed with information, including a quintuple chronology and a fifty-page section devoted to the analysis of selected songs, Noel and Cole will be an essential reference as well as a fascinating dual biography of two men who brought style and dazzle to the art of popular entertainment. View More In Composers & Musicians.